Over the Chinese New Period, I met several people who talk about the "Freak Elections Result" in 2015. From a historical perspective, in a General Elections, any vote swing beyond 5%-6% would be considered as a "Freak Elections Result". However, this may no longer be true anymore. The following is a tabulation of the increase of voters compared between GE2011 and GE2015. The table include a calculation net of Tanjong Pagar GRC as this was the only GRC not contested in 2011. As we can see the increase of the Total Eligible Voters is about 4.77% while the increase in Total Voter Turnout Net of Tg Pg is 5.48%. We have to bear in mind that this is quite a substantial increase (over 1% increase per year) despite the fact that we are facing a low fertility rate since 1990s. Couple with the fact that there is an actual gradual increase of people giving up Singapore citizenship and a deduction effect due to death, we would expect either minimal increase or a zero increment of voters base, or even a negative impact on voters number. I do not have the time to look through the time series of figures on Death and Migration out of Singapore for the past decade and compared them to the figures of total number of births 21 years ago in correspondence to these figures to get an idea of how would the net effect on voters base for the the various GEs, but I suspect these figures should more or less canceled off. However, this is not true at all. There is in fact a "healthy growth" of voters base. The piece of puzzle lies in the number of New Citizenship PAP government has been giving out all these years. In the above graph, it shows the trend of New Citizenship given out from 2007 to 2014. These figures are not complete as we need 2006 to 2015 data to do a full analysis. I have used an estimation of the numbers of New Citizenship for 2006 and 2015 by assuming that it is the same as 2007 and 2014 respectively for the table below. 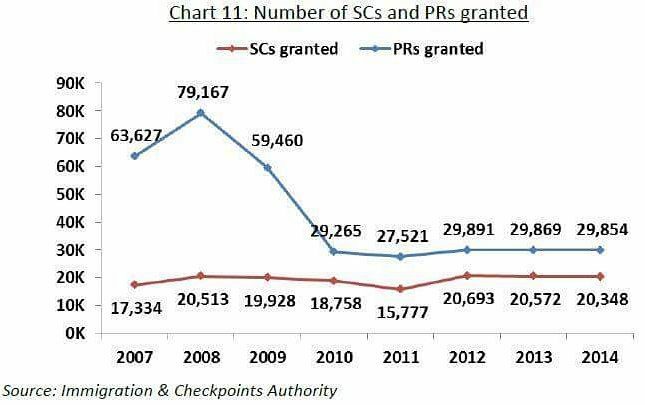 We can see from the graph above that PAP has been giving away Permanent Residency like nobody business from 2007 (or even earlier?) to 2010. Even when these stabilized in 2010, the number of New Citizenship issued had actually increased a bit and maintained at above 20,000 from 2012 till 2014. This is despite the fact that PAP has said it is reducing the intake of foreigners since 2012 protests against the 6.9m Population White Paper! PAP has in fact maintained a high number of PRs and New Citizenship issued from 2012 throughout till 2014! Even so, I do not quite trust these figures simply because the figures don't really add up as I would expect if the detailed study on Death, migration out plus corresponding new born 21 years would have a slight negative impact on voters base. If you take a look at the tabulation below, you will see what I mean. We can see from the table above, with certain estimation and adjustment made, the sole POTENTIAL FULL impact of the increase of New Citizens from 2011 to 2015 is about 3.45%. This is about 2% to 3% lesser than the estimated increase of eligible voters or voters turnout from 2011 to 2015. This practically implied that on average, there is still a net increase in voters base even when new citizens were taken out of the picture. We may not know the truth but let's leave it as it is. IPS erroneously concluded that the impact of New Citizens on GE2015 results is just 2% to 3% due to this over simplistic calculations. 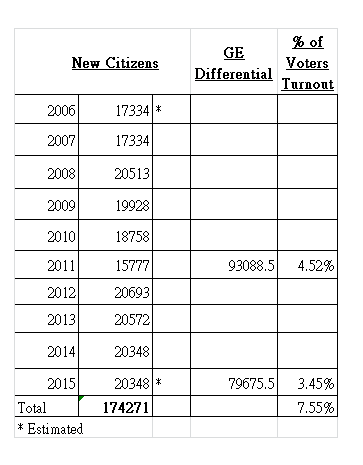 It is assuming that those New Citizens who came in prior to 2012 did not change their voting patterns in GE2015. I beg to differ. If you would have remembered, PAP has made a STRANGE announcement right after GE2011 that it is going to pursue a 6.9 million population target by 2030. It is strange for PAP to come up with such "White Paper" when it has just suffered a little electoral defeat in GE2011 with a reduced majority vote. The anger from the voters would have made PAP more wary to announce such plan especially when prior to GE2011, many people, including me, have shown data that the population has increased at an unsustainable rate and it has caused shortage of public housing, crowded hospitals as well as trouble public transport system with major breakdowns of MRT! It was a very puzzling move at that point of time which many people perceived it as "suicidal" of PAP of doing so. It seems that PAP has "stupidly" exposed the "reason" of all the troubles we had for people to pin point directly at the FTs and New Citizens! Some how, protests erupted against the 6.9million Population White Paper and anti-FT loud cries were made. And some people started to call such movement or protests as "Xenophobic". PAP wayang a bit and started to say that they will control the total number of inflows but as we can see from the raw data, they had at the same time increased and maintained the total number of New Citizenship issued out each year! I would say that we have been out-maneuvered by PAP! PAP has deliberately put up the massive population idea to lure or ignite anti-FT and anti-New Citizens sentiments. This will invoke the emotional responses from ALL New Citizens, past and present, not just those 80,000 New Citizens initiated from 2011 to 2015 but including all past New Citizens! Thu, I would say that it is erroneous to conclude that the impact of New Citizens to be minimal at 2% or 3%. Their impact or influence might have been more than 7% due to the political scheming of PAP in invoking the 6.9m population controversy. Looking forward to next GE, I believe PAP will continue its aggressive New Citizenship policy or even increase the number of New Citizenship issued per year for the coming decades. I would expect after this article appeared, you will no longer find any data on the time series of total number of PRs and New Citizenship issued for past and future years. This is part of the reason why PM Lee is so confident that opposition will never ever be able to win any substantial number of seats in future elections that he is willing to cut down the sizes of GRCs,, increase the number of SMCs as well as NCMPs! Due to the success of their New Citizens strategy, they believe that they will be invincible in the future GEs! So my dear Singaporeans, it is time for us to rethink of what we should do next for our country and future. PAP has finally found the "perfect way" to GAME the voting system here. The day of REAL Democracy Reforms will not come if we do not make a concerted effort to push for it. If we, collective as a people, would only think of our own selfish interests instead of the big picture. It will take a tremendous great amount of time for most New Citizens to realize that we need to break away from a one party monopoly system but for us, could we wait that long? On 18 March 2016, PAP has revealed that there is an average of 18795 new citizenship given out from 2006 to 2015. It means that there is a total of 187950 new citizen voters in 2015 as compared to 2006! My estimate above has underestimated the numbers and impact. The maximum POTENTIAL impact will amount to 8.1%! And by the look of it, my suspicion that the total number increase of voters from 2006 to 2015 may be solely or predominantly due to the increase of New Citizens ALONE! Spot on,Mr Goh.When they said they want to reduce the size of GRCs and increase the no. of SMCs and accord equal voting rights for NCMPs,I knew something fishy must be going on.PAP actually had got everything under control and will be aiming for a clean sweep next GE. More new citizens may have contributed a bit to PAP's increased vote share in GE 2015 but it is not a major factor. 1. The opposition, as a result of people like Goh Meng Seng, Tan Jee Say and Jeanette Chong, has become even more disunited and weaker than in 2011. 2. And being more disunited, weaker and with their leaders not even on speaking terms with each other, let alone work together as govt, but yet contesting 100% of seats! 3. WP had publicly said during the elections that they will not work with other opposition parties to form the govt. 4. WP, and being the strongest among the opposition, has demonstrated it is not capable of even managing the finances of a Town Council, let alone the govt. 5. Due to the above, it will be a real political disaster had the 70% voted for the opposition to become govt. But a govt still has to be elected so PAP won big as a better choice, being the lesser of 2 evils. 2ndly unless U have never done infrastructure planning or project management of any kind before, U would know that U plan for a larger user base and factor in potential growth. The issue with the 2011 GE complains about lack of housing and transportation to support the current population was due to incorrect population growth planning at least 10-20 years before. Be mindful, we have a few practical with a touch of humane writers to the forum page. What a waste that some of these people have not come forward to be MPS. The most worrying about the present MPS are always late and only act as post man to the different agencies. Forward to the authorities and sent the reply back to you. The ministers culture is only to give speeches with we should do this and that. Second put their thoughts on their Facebook. Manual help is on the decline. PM Lee has got his heart in the right place, but lack the authority of his father. Mrs Lee Ho Ching is a gentle matronly soul who stood graciously beside her husband as MRS PM. Though some ministers are becoming a joke, and the economy feels like stagnated in most areas, lets tighten our laces and use the free time for our love ones.